Think the mediterranean diet and I think of tomatoes, fresh herbs and olive oil. 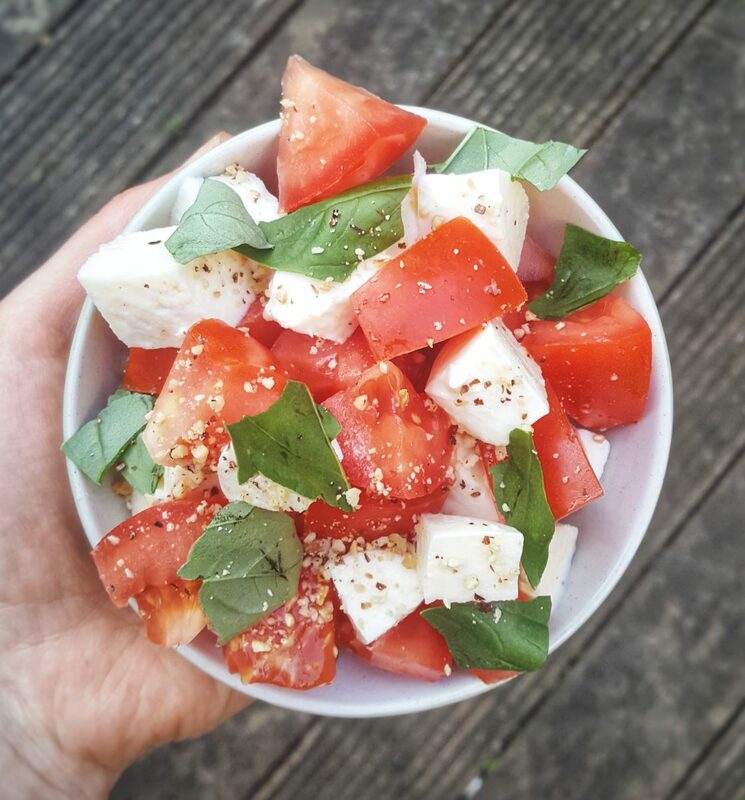 Caprese salad originates in Italy as it combines all the colours of the Italian flag! It is so easy to make it’s difficult to get it wrong. The quality of your ingredients will obviously provide differing levels of flavour but either way it’s a utterly delicious salad. Vine tomatoes are my favourite to use as the flavour is just amazing! Multi-coloured cherry tomatoes are gorgeous too for this kind of a salad to add even more colour! Serves 3 as a side. Drain the mozzarella ball and chop into chunks. Cut the tomato into bite sized pieces or halve the cherry tomatoes. Place the hazelnuts in a dry frying pan over a medium heat and toast until the skin begins to lift off. Place on a chopping board and press the back of a large knife down to crush. To serve: mix the mozzarella and tomatoes together in a dish, scatter over the basil and crushed hazelnuts.